The early voting experience has been challenging for voters and early voting election workers alike this year. In a Dallas Morning News report headlined, "Early voters report obstacles at polls," the newspaper says, "At another Collin County station, voters whose names were not listed in the state's new electronic voter database – even some with registration cards – were turned away and told to come back later." Actually, none of the voters who turned in a new voter registration registration application or change of information form after some point in mid September can not be found by Collin County's new ePollBook system being used by elections clerks to qualify voters when they show up to vote. This is what went wrong and why election clerks have been calling the election office voter look up hot line so often to manually qualify and check in so many properly registered voters. The new VoteSafe ePollBook election software package that Collin County recently purchased from the San Diego based election management application software vendor Votec, and is using for the first time in this election to look up voters, works much differently from the old election software the county has used to qualify and check-in voters for several prior years. The old election software application could access the most current registration data, but the new VoteSafe application can only access an old copy of the registration data created some weeks before the start of early voting. This year many thousands of new voter registration applications postmarked from September through the October 4th registration cutoff date had yet to be processed when the registrar's master voter registration database was copied to load onto the VoteSafe ePollBook check-in laptops. Election clerks are using those laptops, loaded with the newly purchased VoteSafe election software and old registration data, to check-in voters for the November 4, 2008 election early voting period. Almost all of the voter registration applications postmarked from September through the October 4th had actually been processed and entered into the registrar's master voter registration database by the first day of early voting. However, election clerks using the new VoteSafe ePollBook software application to check-in voters can see only an old copy of registration information that, by the start of early voting, was already several weeks old. So, early voting election clerks can not use the check-in computers to directly qualify, perhaps, up to 20,000 newly registered voters. For these newly minted voters the election the Judge, Alternate Judge or designated "special help" clerk must call the "County Elections Office Voter Look Up Phone Hot Line." Voter ID information is verbally repeated to hot line help clerks who then access the master voter registration database to verbally qualify each of the new voters. The voter's name, registration certification number and other information must then be manually written on the election combination signature form and also again separately written on a "tally" list by the Judge, Alternate Judge or designated clerk so the elections office can later mark the voter's master record as "voted." During the ten days of early voting so far, many thousands of new voters across Collin County have been "manually" qualified to vote using this procedure. At least one Election Judge and Alternate Judge team in charge of the Carpenter Park Recreation Center Early Voting Location immediately realized the "voter not found" problem was due to ePollBook software issues and started calling the Collin County election office voter look up hot line to manually qualify voters from the first hour of early voting. Unfortunately, Judges and Alternate Judges at most other early voting locations incorrectly told voters presenting a newly issued orange voter registration card, which VoteSafe could not qualify, that they could not vote or that they must go through the time consuming process of completing a "provisional ballot." These Election Judges had no idea that the newly purchased VoteSafe check in software functioned far differently from the software they had used for several years to qualify and check in voters. Election Judges expected to find a current voter registration record via VoteSafe for anyone presenting a registration card, even for any just issued cards, because that is the way the process had always worked in the past. When VoteSafe returned "Not Found" on people presenting new registration cards with, what most Judges likely thought were, usually high registration serial numbers during the first days of early voting, some Judges possibly considered that some kind of voter fraud was being perpetrated -- After all, conservative talk radio commentators have been warning for weeks that Democrats, aided by ACORN, are plotting to steal the 2008 election and that liberal voter fraud is rampant. The lion's share of newly registered voters are likely planning to vote for Democratic candidates. Still, it is difficult to fault Election Judges for initially being suspicious of these "not found" registration records, even for people presenting a valid registration card, because they were never told about the radical change in software function and election procedure with the adoption of the VoteSafe application. By the middle of the first week of early voting Sharon Rowe, the Collin County Election Administrator, had instructed all the early voting Judges that voters should not be turned away or told to fill out provisional ballots when a new voter's registration can be verified by calling the Elections Office Voter Look Up Hot Line. How does this new VoteSafe election software application work? As the picture shows there are two main component assembles of the "VoteSafe" ePollBook application system. One component assembly of this distributed ePollBook application system is installed on laptop computers used at the polling locations to look up and qualify voters during voter check-in. The Votesafe configuration on each of these voter check-in laptops includes a copy of the master voter registration database that, by the start of early voting, was signifigantly out of date. The Votesafe software running on each voter check-in laptop uses its own local copy of the voter registration database to look up and qualify voters to receive a ballot. Part of the look up information returned to the election clerk, for each qualified voter, is the particular "ballot style" that each voter must be given to vote. (Collin County has 52 unique ballot styles for this election.) Each voter qualified by the clerk to receive a ballot is then marked as 'Has Voted' in the local registration file copy installed on the check-in laptop used by that particular clerk. The laptop prints a label containing the voter's registration serial number and other information. The clerk affixes the label to the combination signature, which the voter then signs. After this check-in procedure is complete the voter is given a ballot card and allowed to mark the ballot. The other part of the distributed VoteSafe application system runs on the county's election office elections server. 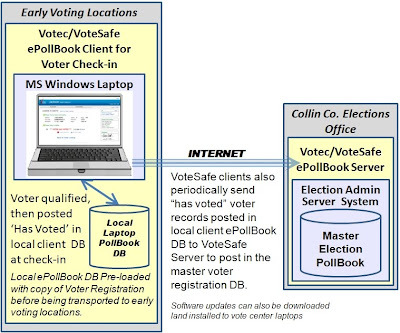 This part of the VoteSafe application periodically connects, via a secure Internet connection, with each voter check-in laptop used at each early voting polling location to upload the names of people who are marked as 'Has Voted' in the laptop's registration data file. New voter registration records added and old records that are updated in the registrar's master voter registration database after it was copied, to be installed on each of the check-in laptops, does not synchronize down to the local check-in laptops laptop computers. According to data posted on the Texas Secretary of State and Collin County Elections Office websites approximately 20,000 new voters registered to vote in Collin County between March 2008 and September 2, 2008 boosting the total number of registered voters to 403,465. Voter registration drives continued across the county until the October 6th registration cutoff date and a small mountain voter applications postmarked up to October 6th date continued to flow into the county registrar's office every day for several days after the cutoff date. The Collin County master voter registration database contained approximately 408,000 registered voters by Oct 1, 2008, with a five or six day backlog of registration applications still waiting to be processed. The final tally of registered voters will be in the neighborhood of 424, 000 people. We can, then, conclude that approximately 20,000 new voter registration records have been added to the registrar's master registration data base since the data was copied to be loaded into each of the local Votesafe ePollBook check-in laptops. It is these newly added and update voter records that are not directly available to election clerks through the Votesafe ePollBook system. Election clerks must qualify these voters by calling the Elections Office Voter Look Up Hot Line and then hand write their information on the signature combination form. This results in additional delays for voters who must wait in a special 'Hot Line' lookup voter line after first waiting in the regular check-in line. "It's hard work working hard" and poll workers across Collin County, and all of Texas, have been working hard to accommodate the crush of early voters. So far, early voting totals are far out pacing the daily early turnout totals of the 2004 presidential election. More than 1.1 million Texans cast ballots in the 15 most populous counties through Thursday, compared with 655,265 in the top 15 counties four years ago, according to figures given on the Texas Secretary of State's website. Word has reached some early polling locations that after church services on Sunday many parishioners are planning to go directly to early voting locations as part of a voter mobilization project called "Super Sunday." Typically, turnout during the second week of early voting is much heavier than in the first week of voting. The table below uses 2004 daily early voting numbers, from the Texas SOS website, and 2008 actual week one turnout numbers to project voting turnout numbers that Collin County election workers might expect for the second week of early voting. Elections officials said Tuesday that more than 340,000 Texans cast in-person or through mail ballots once polls closed Monday in the state's 15 largest counties. That's compared to about 190,000 Texans in those same counties on the first day of 2004, the last presidential election. In Collin County, voting was brisk, said Collin County elections administrator Sharon Rowe. Lines several dozen people deep started forming early at voting sites in Allen, McKinney and Plano. "There has been a steady stream of voters all day," Ms. Rowe said. In 2004 the number of first day election results in Collin County was 9,137 which was 2.47 percent of registered voters. This year the number was 13,900 which was 3.27 percent of registered voters. Second day voting turnout was about the same. Associated Press - Record numbers of early voters packed polling locations from Houston to El Paso on Monday in what officials said could likely be the start of an unprecedented election turnout in Texas. "If it sustains and continues through the 12-day (early voting) period like this, there's not going to be anything close to compare it to," said Bruce Sherbet, Dallas County's elections administrator. After today I'm starting to think this higher end projection is not nearly high enough! Early Voting runs from 8AM October 20 to 7PM October 31 at several locations in Collin County and every other county in Texas. You can vote at any early voting polling place in your county of residence. Unofficially, it is estimated that the Collin County elections office had nearly 424,000 registered voters by Oct 15, 2008 with a backlog of unprocessed registration requests. The final number will likely approach 430,000 registered voters in Collin County for the November 2008 election. This compares to approximately 381,000 register voters for the March 2008 primary election and 369,412 register voters for the November 2004 election. In the November 2004 election 246,617 (66.8%) of the 369,412 register voters cast a ballot in that presidential election. 150,001, or 40.6% of 2004 registered voters, cast their ballot during early voting voting of that year. If the same 2004 percentages of registered voters cast ballots in the 2008 November election, then 284,395 votes will be cast in the entire election, 172,979 votes will be cast during early voting and 111,416 votes will be cast on November 4th, Election Day, in Collin County, assuming the final registered voter count stands at 426,000. I strongly recommend that if you are a new first time voter who has just registered, you should vote early this year. If there has been any minor snafu in processing your voter registration application, it is usually much easier for the Election Judge to help you resolve the snafu during the early voting period. Every voter, particularly first time voters, should check their registration status on the Collin County or Texas Secretary of State website before going to the polling place to stand in line to vote. If you do not find your name in the voter registration database, you can call the elections office from home to resolve the problem. Check your registration status through the Collin County website here. Check your registration status through the Texas Secretary of State website here. Please remember to take your Voter's Registration Card with you to the early voting polling place when you vote. Please DO NOT cut the bar code off of the orange card - election clerks can use the bar code to electronically verify your voter registration status, which makes the voting lines move much faster for everyone!!! Did you receive your Orange Voter's Registration Card? If you did not receive an orange registration card during 2008, your voting registration record may have been "suspended" or "purged." Check your registration status here. The Washington Post reported last week that a growing number of doctors believe that McCain's melanoma is "more advanced than his physicians concluded and that the chance of recurrence is consequently higher." Lawrence Altman, a veteran New York Times reporter and one of the few medical doctors working as a full-time journalist, has spent weeks working with the campaigns and medical professionals on a story in Monday's edition of the NYTimes that raises serious questions about the true state of John McCain's health. Much of the speculation centers on new questions about the status of John McCain's health. We've all noticed John McCain having those "John McCain moments. He gets confused. His thinking is unclear. When he's asked a question, he hesitates for long periods of time and can't remember the question. When he does respond to a question, the one about Corsi's book for example, he gives a diffuse inappropriate answer; "need to have a sense of humor about these things." He now reads everything off small cards and sometimes it appears that he may not know what's going on. Does anyone believe that his condition may be worse than his campaign strategists would lead us to believe? UPDATE: Because the McCain campaign is still refusing to release McCain's medical records, and refuses to say a word of explanation about McCain's strange facial convulsions that have now been repeatedly caught on film in the past few weeks, I'm bumping this post. America deserves to know if John McCain, who is 72 years old and has 4 bouts of serious melanoma, and who has been acting erratically and confused of late, is physically or mentally ill and not coming clean about it. There are now several videos circulating that strongly suggest there may be some neurological problem causing extreme facial ticks and rapid eye blinking. Americans are clearly interested in knowing what is wrong with John McCain's health. During a recent campaign speech in Pennsylvania John McCain said,"Across this country this is the agenda I have set before my fellow prisoners," he declared. Then, without even realizing what just came out of his mouth McCain continued to berate Obama saying, "The same standards of clarity and candor must now be applied to my opponent." In the prepared remarks he was to say "fellow citizens" not "fellow prisoners." This is the kind of mental mix-up that really makes one wonder what is truly going on inside of John McCain's mind - is everything really OK in there? There have been an increasing number of posting and videos that call for John McCain, who would be the oldest president in history if elected, to fully release his medical records. For a very brief three hours in May, McCain did release 1,173 pages of his medical records to a carefully selected group of reporters. They were not allowed to make any copies or phone calls. Why such secrecy? In an appearance on Meet the Press and a subsequent press conference, former Secretary of State and Chairman of the Joint Chiefs of Staff Colin Powell threw his support to Barack Obama. Calling for a "generational change," the 71-year-old retired general praised Obama's steadiness during the financial crisis. "I come to the conclusion that because of his ability to inspire, because of the inclusive nature of his campaign, because he is reaching out all across America, because of who he is and his rhetorical abilities -- and you have to take that into account -- as well as his substance -- he has both style and substance," Powell said. "He has met the standard of being a successful president, being an exceptional president." Powell noted that McCain has been a good friend for 25 years, but expressed disappointment in the "over the top" negative tone of the GOP campaign, as well as in McCain's choice of Alaska Gov. Sarah Palin as the vice presidential nominee. "Now that we have had a chance to watch her for some seven weeks, I don't believe she's ready to be president of the United States, which is the job of the vice president," Powell said. "And so that raised some question in my mind as to the judgment that Senator McCain made . . .
...Mr. McCain says that he's a washed up terrorist, but then why do we keep talking about him? And why do we have the robocalls going on around the country trying to suggest that because of this very, very limited relationship that Senator Obama has had with Mr. Ayers, somehow Mr. Obama is tainted. What they're trying to connect him to is some kind of terrorist feelings. And I think that's inappropriate. Now, I understand what politics is all about, I know how you can go after one another and that's good. But I think this goes too far, and I think it has made the McCain campaign look a little narrow. It's not what the American people are looking for..."
...Powell also spoke against the insinuations by some Republicans that Obama is a Muslim, "Well, the correct answer is, he is not a Muslim, he's a Christian. He's always been a Christian," he said. "But the really right answer is, what if he is? Is there something wrong with being a Muslim in this country? The answer's no, that's not America. Is there something wrong with some seven-year-old Muslim-American kid believing that he or she could be president? Yet, I have heard senior members of my own party drop the suggestion, 'He's a Muslim and he might be associated terrorists.' This is not the way we should be doing it in America. " [Texas] County elections administrators reject the conclusions of a report alleging that up to 333,000 noncitizens may be registered to vote in Texas, saying there is no evidence of widespread voter fraud in the Lone Star State. The report by David Simcox, the former head of a think tank that favors less immigration, said an estimated 1.8 million to 2.7 million noncitizen immigrants in the U.S. may be illegally registered to vote, thereby potentially influencing the outcome of the upcoming presidential and congressional elections. Using population estimates from the Census Bureau and Texas county registration data, Mr. Simcox calculated that Dallas, Harris, Starr and Presidio counties, as well as others, had higher numbers of registered voters than those who are eligible, which may indicate noncitizens are registered to vote. But elections administrators said this week that there's no proof that county officials are registering a significant number of noncitizens to vote. "I don't think we are, and I have no evidence that we have people overregistered to vote," said Dallas County Elections Administrator Bruce Sherbet. Steve Raborn, elections administrator for Tarrant County, said a two-year investigation by his office of questionable voter registrations in 2004 and 2005 found only three noncitizens on the county voter rolls, and they were later removed. He said he couldn't completely discount Mr. Simcox's findings. "We probably have some noncitizens on the rolls, just like we probably have some dead people or some felons on the rolls, but it's not a big problem," Mr. Raborn said. "If they're illegal aliens, they're going to stay under the radar." Mr. Simcox, former executive director of the Washington-based Center for Immigration Studies, said voter registration has become an honor system that lacks tough enforcement and may be easily manipulated. He cited Democratic U.S. Senate candidate Rick Noriega's campaign as a possible motivation for noncitizens to attempt to register to vote in hopes of influencing the election. With a hotly contested presidential election, there has been a surge in voter registration this year, as well as concerns about fraud and voter disenfranchisement. This week, Nevada officials raided an ACORN office amid accusations that the group, which registers low-income people, had processed fraudulent voter registrations. And The New York Times reported that thousands of eligible voters have been removed from rolls or blocked from registering in at least six swing states in apparent violation of federal law. Immigration advocates say Mr. Simcox is just trying to inflame people's hostilities toward immigrants and make it more difficult for legally eligible immigrant citizens to vote. The report "proves the old adage that if you 'torture numbers long enough you can get them to say anything,' " said Angela Kelley, director of the Immigration Policy Center. "Yes, we need to be vigilant to preserve the integrity of the voting system in America, but there is no evidence ... that finds voter fraud by noncitizens is a problem or legitimate worry, but rather, it's an urban myth." The county officials said voter fraud was difficult to carry out in Texas because each applicant must submit a driver's license number or Social Security number, which is entered into a statewide electronic database and checked by the secretary of state's office. Applicants are sent a voting card and officially added to the rolls only if there are no discrepancies and the secretary of state's office approves the application. If there is evidence of voter fraud, local officials are required to turn it over to the Texas attorney general for investigation. WASHINGTON — - As the economy worsens and Election Day approaches, a conservative campaign that blames the global financial crisis on a government push to make housing more affordable to lower-class Americans has taken off on talk radio and e-mail. They've specifically targeted the mortgage finance giants Fannie Mae and Freddie Mac, which the federal government seized on Sept. 6, contending that lending to poor and minority Americans caused Fannie's and Freddie's financial problems. Federal housing data indicate that the charges aren't true, and that the private sector [that was large deregulated by Republicans, including John McCain] not the government or government-backed companies, was behind the soaring sub-prime lending at the core of the crisis. Sub-prime lending offered high-cost loans to the weakest borrowers during the housing boom that lasted from 2001 to 2007. Sub-prime lending was at its height from 2004 to 2006. More than 84 percent of the sub-prime mortgages in 2006 were issued by private lending institutions. Private firms made nearly 83 percent of the sub-prime loans to low- and moderate-income borrowers that year. Only one of the top 25 sub-prime lenders in 2006 was directly subject to the housing law that's being lambasted by conservative critics. The "turmoil in financial markets clearly was triggered by a dramatic weakening of underwriting standards [Republican pushed deregulation legislation and no enforcement of the few remaining regulations by the Bush Administration] for U.S. sub-prime mortgages. . .
. . .Between 2004 and 2006, when sub-prime lending was exploding, Fannie and Freddie went from holding a high of 48 percent of the sub-prime loans that were sold into the secondary market to holding about 24 percent, according to data from Inside Mortgage Finance, a specialty publication. One reason is that Fannie and Freddie were subject to tougher standards [regulations] than many of the deregulated players in the private sector who weakened lending standards, most of whom have gone bankrupt or are now in deep trouble. During those same explosive three years, private investment banks — not Fannie and Freddie — dominated the [problem sub-prime] mortgage loans that were packaged and sold into the secondary mortgage market. In 2005 and 2006, the private sector securitized almost two thirds of all U.S. mortgages, supplanting Fannie and Freddie, according to a number of specialty publications that track this data. Some background on why the regulations that the Republicans eliminated might have prevented this financial mess. For the last eight years, the Bush Administration and John McCain have been systematically against any form of appropriate regulation and supervision of the financial system. The ideology was laissez faire, free markets, reliance on self-regulation, which means no regulation. Regulators' absence was just part of the cause of the housing bubble. The most important catalyst behind the bubble may have been the Federal Reserve's move to keep interest rates near all-time lows for three years, which acted as a clearance sale for lenders and mortgage backed securities packagers, which the banking system deregulation enabled. The Fed cut its target short-term interest rate for overnight loans to banks, the federal funds rate, from 6.5 percent in 2000 to 1 percent by 2003. Loans for cars, homes and houses were on sale, almost 85 percent off. Cheap credit spurred cheap loans, which increased activity in the housing sector and that fueled the rise in housing prices. The Bush Administration viewed the cheap credit chain of events as fuel for the economy after the burst tech bubble and the Sept. 11 attacks of 2001. Bush dub'ed this the "ownership society" during his 2004 reelection campaign. Variable rate mortgages, tied to the funds rate, were dirt cheap during the period when the Fed kept its target short-term interest rate at 1 percent. These were the easiest and fastest and most profitable type of loans for lenders and home builders to promote to borrowers. Banks, home builders and mortgage companies were pushing the dirt cheap "sub-prime type" adjustable or variable rate mortgages to both existing home owners and new home buyers. The faster that each of these entities could get borrowers through the loan process, the faster they could make a profit and "sub-prime type" loans were fast to close. A variable or adjustable rate mortgage (ARM) is a mortgage loan where the interest rate on the note is periodically adjusted based on the Fed Funds Rate or perhaps other index. The monthly loan payments typically start low and remain lower than regular fixed rate prime loans for two, or so, years. After two years monthly loan payment typically balloon far above the typically payment of a regular prime loan. A certain variation of this type of loan is typically the only kind of loan that sub-prime borrows can get because their credit score disqualifies them from getting a regular prime loan. The legitimate sub-prime mortgage market makes mortgages (and home ownership) available to a segment of the population that otherwise is shut out of the market. Sub-prime type mortgages are not for the correct loan for everyone. Only those borrowers with some credit problem should ever consider taking a sub-prime, for a well planned short period of time, as part of a plan to repair their credit score. One of the things that rapidly inflated the sub-prime mortgage bubble (a more accurate term than "housing bubble") is that many borrowers, who were eligible for normal mainstream loans from mainstream lenders were "steered" (fast talked with a slick marketing pitch) into the sub-prime market - The majority of sub-prime borrowers had credit scores good enough that they could have, and should have, been advised to apply for a regular or prime fixed rate mortgage, but they were sold or "steered" into sub-prime type loans. Prime borrowers were steered to sub-prime type loans because they were easiest and fastest and most profitable for the mortgage lenders, not because they were the best and most suitable loan for borrowers. Most of these commercial mortgage brokers, who heavily pushed these sub-prime type loans, quickly bundled the loans as "mortgage backed securities" and sold them to investors. Selling these bundled loans increased the mortgage brokers' profits and eliminated all their risk, and future responsibility, on the loan paper. One of the main reason so many borrowers, both prime loan qualified and sub-prime loan restricted, ended up with sub-prime type loans is that borrowers were actively solicited by unscrupulous sub-prime lenders who pitched sub-prime deals that turned out to be "to good to be true." Sub-prime lenders aggressively marketed to existing home-owners, who already had regular mortgages, and new home buyers alike. Remember all the TV Ads; They pitched that home-owners could take cash out of their properties through a cash-out mortgage refinance to pay off credit cards or home-owners could dramatically lower their monthly payments. New home buyers were allowed make "no down payment" loans or make loans over the true home value, through some slight of hand, and pocket the cash difference. Most of these sub-prime lenders targeted every demographic group, but some sub-prime lenders did target lower-income neighborhoods where people often need some extra money just to make ends meet. Many occupants of such neighborhoods, who were left out of work when their former employers move were jobs to cheap labor off-shore locations, were very receptive to both the extra cash pitch and the lower monthly mortgage payment pitch. No one was making it clear to these borrowers that when the Fed, sooner or later, started to raise its funds rates from 1 percent to 5+ percent, the month payments on those "sub-prime" variable mortgages would increase by thousands of dollars. It was the Republican caveat ēmptor (buyer beware) rule of business where government had no role to play to define the rules of the game or referee the game to make sure everyone was playing a fair, transparent and honest game. After sub-prime home loans were written by mortgage broker lenders, they packaged as "mortgage backed investment securities" and sold to investors. The sub-prime lenders therefore had no reason to care whether the borrowers would or could ever pay on the loans once the rates and monthly payments started to go up - it was immediately someone else's, the investors', problem and risk. Again, it was the Republican caveat ēmptor (buyer beware) rule of business for the securities investors too. This is where some well enforced government oversight and regulation would have nipped the problem in the bud. The "Truth In Lending" regulation that Conservative Republicans eliminated, with John McCain leading the way, in particular, would have forced the sub-prime lenders to fully explain how the "too good to be true" sub-prime loans really worked. Other regulations that Conservative Republicans eliminated would not have allowed sub-prime lenders to make loans to people who clearly could not make the monthly loan payments once the interest and payment rates inevitable started to adjust up and up and up when the Fed started raising its Funds Rate. The discarded regulations also would not have allowed commercial mortgage brokers to bundled the "ticking time bomb" loans as mortgage backed securities and sell them to unsuspecting investors. During the 2003 to 2005 period when the Fed dropped its Funds Rate to 1 percent, the Republican controlled congress could have passed one simple regulatory law to head off the financial melt down. That one simple regulation could have restricted variable or adjustable rate loans from indexing the variable interest rate to the 1 percent funds rate. Everyone knew the 1 percent funds rate would head back toward 6 percent sooner rather later. The Funds rate was going back up, it was inevitable, everyone knew it! The, then the Republican controlled, congress should have, at the very least, mandated an indexed adjustable loan interest rate floor index of 5 percent. As the sub-prime mortgage bubble rapidly inflated from 2003 through most of 2006, the Republican controlled Congress, blindly following its ideology of free market self-regulation, did nothing to stop or control adjustable rate sub-prime type lending or control what amounted to predatory lending behavior practiced by some mortgage brokers. Texas Conservatives like Republican incumbent for the U.S. 3rd Texas Congressional District, Sam Johnson, age 78, Republican incumbent for the U.S. 4th Texas Congressional District, Ralph Hall, age 85, and Republican incumbent Senator John Cornyn all supported Senator John McCain's philosophy of deregulation and all voted to eliminate Banking, Securities Trading and Home Mortgage Loan regulations. The Bush Administration did not even use the few remaining regulatory levers, that Conservative Republicans had not yet legislatively eliminated, to control the problem. As the Fed raised its Fed Funds Rate from 1 percent in June 2003 back up to 5.25 percent in June 2006 all those variable rate mortgages started resetting to higher and higher interest rates. By early 2007 the higher Fed Funds Rate was starting to ripple through the system and the sub-prime mortgage bubble was starting to burst. The now 15-month old turmoil began when home buyers with inadequate income to make their constantly increasing "adjustable" monthly mortgage payments began to default on their mortgages. By the summer of 2007 adjustable rate mortgages were resetting at levels that the chain reaction mortgage defaults and home foreclosures became national news. Even then, the Bush Administration, following its ideology of free markets self-regulation, did nothing to get ahead of the problem even as foreclosures steadily increased from mid-2007 and then soared for most of 2008. Even as home-owners increasingly faced foreclosures, John McCain and other Conservative Republican deregulators actively blocked action by congress through filibuster threat and other minority party procedural maneuvering. Texas Conservatives, including U.S. Congressmen Sam Johnson and Ralph Hall, and U.S. Senator John Cornyn, have all supported John McCain's and President Bush's call to actively resisted every move that Democratic Legislators have attempted to restore regulatory oversight and get ahead the disaster that has now fallen upon the country and the rest of the world. Now, the problems have spread to the entire economy and todays American taxpayer and their children, tomorrows taxpayers, are is stuck paying the price tag to fix the problem. Given the global economic crisis, a record 90 percent of registered voters say the country is seriously off on the wrong track, the most since this question first was asked in 1973. At 23 percent, Bush's job approval rating has fallen below Nixon's lowest; it's a point away from the lowest in 70 years of polling, set by Harry Truman in early 1952. Bush's disapproval, meanwhile, is at an all-time record  73 percent. There is a FALSE rumor going around by e-mail telling people that if they vote Straight Democratic Party, they must also cast a vote specifically for Barack Obama in order to have an Obama vote registered. THIS IS FALSE INFORMATION. The truth is that if you cast a Straight Democratic Party vote, you will be voting for Barack Obama and your Straight Democratic vote will count as a vote for Obama. But if you then go down select Obama, you may actually be canceling your Obama vote. Don't be fooled: Just cast a Straight Democratic Party vote and that will get Obama and all the Democratic candidates up and down the ballot. Collin County voters going to one of the early voting locations around the county between October 20th and October 31st will cast their ballots on Premier, formerly Diebold, DRE touch screen voting machines just like the machine shown in the first segment of this video. Collin County voting machines do not have the paper audit tape device shown in the last segment of the video. You may ask the Election Clerk for a Paper Ballot, if you do not wish to use a touch screen. Please remember to take your Orange Voter's Registration Card with you to the early voting polling place when you vote and PLEASE DO NOT cut off the bar code - election clerks can use the bar code to electronically verify your voter registration status, which makes the voting lines move twice as fast for everyone!!! After you check in to vote you will be given a “Voter Access Card” that looks like the card pictured. A Language selection screen will appear in a few seconds after the card is fully inserted and locked into the slot. Touch English or Touch Spanish, then, touch the START button at the bottom right corner of the Language screen. In a few seconds the “Instructions to Voters” screen will then appear. Double check that the Precinct Number shown at the top of the “Instructions to Voters” box is your correct Precinct Number. If the Precinct Number shown is not your correct precinct number, then the Voter Access Card that you were given may not have been properly encoded for your correct (BS) Ballot Style. Notify the nearest Election Clerk if you do not see your correct Precinct Number. 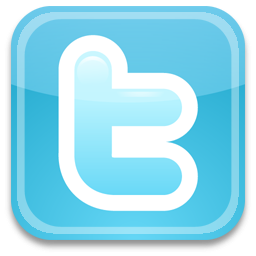 Note: Your Precinct Number, U.S. Congressional District Number, County Commissioner Precinct Number and other important information can be found on your 2008 Orange Voter's Registration Card. Your Voter Access Card will be encode with the BS (Ballot Style) that corresponds to the candidates and propositions for your particular County Precinct, Congressional District, County Commissioner Precinct, School District, City and etc. Read the instructions given on the “Instructions to Voters” screen. When you have finished reading the instructions and you are ready to mark your ballot, touch the NEXT button at the bottom right corner of the screen. To mark your ballot, simply touch the box beside the name of the candidate for whom you wish to vote. The box will change to a X mark as you touch your finger on the box. If you make a mistake and want to de-select a candidate's X mark, simple touch the check box again - The box will change to a clear open box again with the touch of your finger. After you have made your candidate selections on each ballot page, touch the NEXT button at the bottom right corner of the screen to advance to the next ballot page to mark. Repeat this "mark your ballot page then touch NEXT" process until you reach the final summary review page. Instead of marking every candidate's name individually, you can make a single "Straight Party" vote. 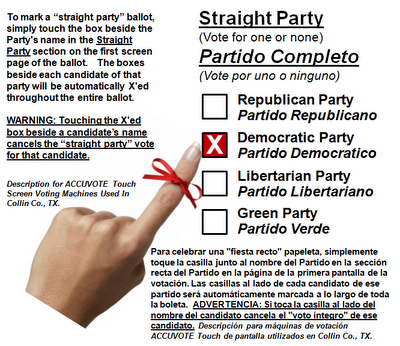 After you have made your "Straight Party" selection by touching the box beside the Party's Name, just touch the NEXT button at the bottom right corner of each ballot page to advance to the next ballot page until you reach the final summary review page. You should see the box beside every candidate affiliated with your "Straight Party" selection marked with an X on each ballot page as you "NEXT" through the ballot. 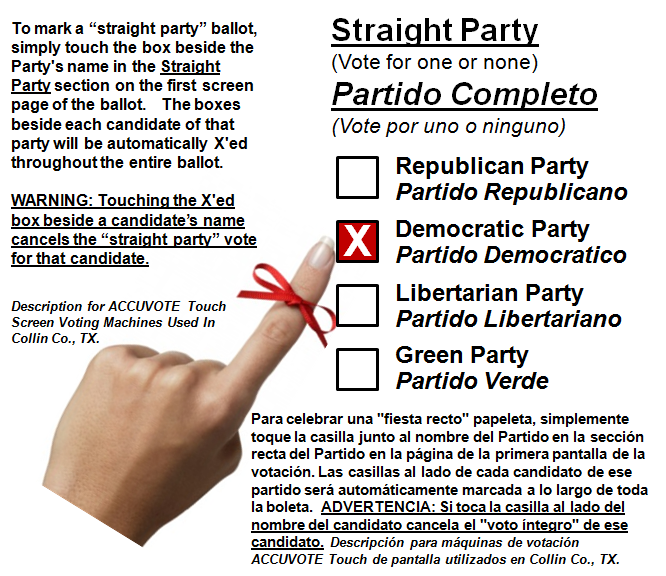 Touching the X'ed box next to any candidate's name (that was automatically X'ed when you touched the Party Name) will "un-mark" or "cancel" your "Straight Party" vote for that particular candidate!! Be sure to very carefully review the ballot summary review page before you touch the CAST BALLOT button. Make sure every candidate for whom you intend to vote has been marked for the vote on the ballot summary. Make sure no candidate for whom you did not intend to vote has been marked on your ballot. Any ballot position where you did not vote for any candidate in that particular race will be highlighted in red. You can go back and change/correct any of your ballot choices before you touch the CAST BALLOT button. If you have any questions or concerns about how your ballot is marked, how your ballot was automatically marked by your "Straight Party" vote or how to go back to change/correct your ballot, attract the attention of any Election Clerk and ask for help BEFORE YOU TOUCH THE CAST BALLOT BUTTON. As soon as you touch the CAST BALLOT button on the bottom right corner of the last summary review page, your voting job is done. The Voter Card automatically ejects after you have finished voting. PLEASE RETURN “VOTER ACCESS CARD” TO ANY POLL WORKER. Your registration card must be signed on the front (orange side) by the X on the bottom left side of the card. Please sign your card before you enter the polling place. a copy of a current utility bill, bank statement, government check, paycheck, or other government document that shows your name and address. This year marks the first time that the new, statewide, centralized voter-registration database will be used in a November federal election in Texas. The Texas centralized voter-registration database was used for the very first time during the Texas March 4th Primary Election. Statewide, centralized voter-registration databases were mandated in the 2002 Help America Vote Act, which requires all election districts in a state or U.S. territory to consolidate their lists into a single database electronically accessible to every election office in the state or territory. The law requires each voter to have a unique identifier. Since 2004, new registration applicants have had to provide a Driver's License number (DL#) or the last four digits of a Social Security number (SS#) to register (voters who don't have them are assigned a unique number by the state). States are required to try to authenticate the numbers with motor vehicle records and the Social Security Administration database. But data entry of voter registration application information is prone to errors such as name misspellings and transposed numbers. Voter registration applicants are prone to make mistakes writing out their DL# and SS# or they write illegibly on applications. The Social Security Administration also acknowledges that matches between its database and voter-registration records have yielded a 28.5 percent error rate. For example: A woman who recently married and changed her name often fail to match government records containing her maiden name and voters who have double or hyphenated last names, very long names or unusually spelled names are also prone to match failures. Collin County will likely have over 30,000 new voters, possibly as many as 45,000 newly registered voters, who have turned in a voter registration application over the past few weeks and months. That means there has been, and continues to be, a lot of fast and furious data entry and voter verification activity in the county and Secretary of State Elections Office for the November elections. The Collin County Elections Office has a good track record of accurately processing registration applications, but remember, they are interfacing with the new State of Texas voter registration database and attending computer application software in this very high registration activity and potentially high voter turnout November presidential election. New voter registration activity has been heavy all over Texas, with over half a million new voters, so all that new software is being pushed hard for the first time! So, new first time voters, don't be surprised if you are asked to show one of the accepted forms identification along with your voter registration card when you sign in to vote. And, Elections Judges, be aware that you may have more "ID Required" voters to process in this election. I strongly recommend that if you are a new first time voters who has just registered, you should vote early this year. If there has been any minor snafu in processing your voter registration application, it is usually much easier for the Election Judge to help you resolve the snafu during the early voting period. Every voter, particularly first time voters, should check their registration status on the Collin County or Texas Secretary of State website before going to the polling place to stand in line to vote. If you do not find your name in the voter registration database, you can call the elections office from home to resolve the problem. Check your registration status through the Collin County website here. Check your registration status through the Texas Secretary of State website here. Early voting starts on Monday October 20th at 8AM and continues until Friday 7PM on October 31st at several convenient locations around Collin County on October 20th 2008. On the Thursday edition of CNN's Anderson Cooper program, David Gergen said the angry frenzied mobs that McCain and Palin are whipping up at their rallies could lead to violence. So, Gergen charges that McCain and Palin are inciting to violence on the campaign trail. The video at left shows Obama predicting that this would be McCain's strategy in a speech he gave last July. COOPER: There's also the question of ruling after this and bringing the country together. It's going to be all the more harder to do that whoever wins with all this anger out there. GERGEN: Yes. There is this -- I think one of the most striking things we've seen now in the last few days. We've seen it in the Palin rallies. We saw it at the McCain rally today. And we saw it to a considerable degree during the rescue package legislation. There is this free floating sort of whipping around anger that could really lead to some violence. 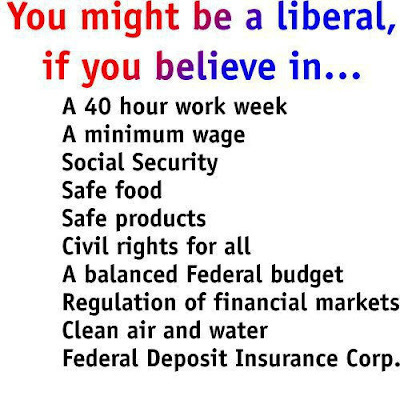 I think we're not far from that. GERGEN: I think it's so -- well, I really worry when we get people -- when you get the kind of rhetoric that you're getting at these rallies now. I think it's really imperative that the candidates try to calm people down. And that's why I've argued not only because of the question of the ugliness of it. John McCain: In 2000, as a lifelong Republican, I worked to get you elected instead of George W. Bush. In return, you wrote an endorsement of one of my books about military service. You seemed to be a man who put principle ahead of mere political gain. You have changed. You have a choice: Go down in history as a decent senator and an honorable military man with many successes, or go down in history as the latest abettor of right-wing extremist hate. Personally, I am getting a little concerned that such fever-pitch emotions could boil over at some election polling places around the country. Bipartisan concern about the hate-mongering has rapidly grown during the past couple of days. "He is not the McCain I endorsed," said Milliken, reached at his Traverse City home Thursday. "He keeps saying, 'Who is Barack Obama?' I would ask the question, 'Who is John McCain?' because his campaign has become rather disappointing to me. "I'm disappointed in the tenor and the personal attacks on the part of the McCain campaign, when he ought to be talking about the issues." Milliken, a lifelong Republican, is among some past leaders from the party's moderate wing voicing reservations and, in some cases, opposition to McCain's candidacy. After Chafee announced his support for Democratic candidate Barack Obama on Thursday morning at Obama's Grand Rapids MI campaign headquarters, Chafee said, "That's not my kind of Republicanism. I saw what Bush and Cheney did. They came in with a (budget) surplus and a stable world, and look what's happened now. In eight short years they've taken one peaceful and prosperous world, and they've torn it into tatters." As for McCain's choice of Alaska Gov. Sarah Palin for his running mate, "there's no question she's totally unqualified," Chafee said. Chafee also added that he has spoken with several other moderate Republican leaders, and "there are a whole lot of us deserting." John McCain: If your campaign does not stop equating Sen. Barack Obama with terrorism, questioning his patriotism and portraying Mr. Obama as "not one of us," I accuse you of deliberately feeding the most unhinged elements of our society the red meat of hate, and therefore of potentially instigating violence. [snip] Stop! Think! Your rallies are beginning to look, sound, feel and smell like lynch mobs. John McCain, you're walking a perilous line. If you do not stand up for all that is good in America and declare that Senator Obama is a patriot, fit for office, and denounce your hate-filled supporters when they scream out "Terrorist" or "Kill him," history will hold you responsible for all that follows. John McCain and Sarah Palin, you are playing with fire, and you know it. You are unleashing the monster of American hatred and prejudice, to the peril of all of us. You are doing this in wartime. 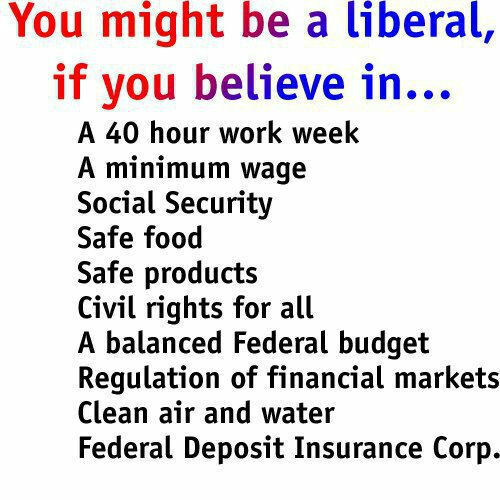 You are doing this as our economy collapses. You are doing this in a country with a history of assassinations. Change the atmosphere of your campaign. Talk about the issues at hand. Make your case. But stop stirring up the lunatic fringe of haters, or risk suffering the judgment of history and the loathing of the American people - forever. We will hold you responsible. LaHood supports the McCain ticket, but doesn't like what he sees at some of the McCain-Palin rallies: When Barack Obama's name has been mentioned by Sarah Palin, there are shouts of "terrorist," and LaHood says Palin should put a stop to it. "Look it. This doesn't befit the office that she's running for. And frankly, people don't like it." Congressman LaHood says it could backfire on the Republican ticket. He says the names that Obama is being called, "Certainly don't reflect the character of the man." As late as 1964, Falwell was attacking the 1964 Civil Rights Act as "civil wrongs" legislation. He questioned "the sincerity and intentions of some civil rights leaders such as Dr. Martin Luther King Jr., James Farmer, and others, who are known to have left-wing associations." Falwell charged, "It is very obvious that the Communists, as they do in all parts of the world, are taking advantage of a tense situation in our land, and are exploiting every incident to bring about violence and bloodshed." Falwell was not alone. These men didn't kill Martin Luther King, but they contributed to an atmosphere of nationalism, white supremacy and cheap unreflective patriotism that ultimately got a lot of people killed. Confronted with Aparthied South Africa, men like Helms and Falwell used the same "communist" defense. While Mandella wasted away in prison, they dismissed the whole thing as a communist plot. Let me be clear--This is the ghost that McCain Campaign is summoning. This is the Ring Of Power that they want to wield. The Muslim charge, the "Hussein" thing is nothing more than today's red-baiting, and it is what it was then--a cover for racists. Those who press this Ayers line of attack are whipping Republicans and conservatives into a fury that is going to be very hard to calm after November. Is it really wise to send conservatives into opposition in a mood of disdain and fury for a man who may well be the next president of the United States, incidentally the first African-American president? Anger is a very bad political adviser. It can isolate us and push us to the extremes at exactly the moment when we ought to be rebuilding, rethinking, regrouping and recruiting. But seriously, folks, I'm beginning to worry about the level of craziness on the Republican side, the over-the-top, stampede-the-crowd statements by everyone from McCain on down, the vehemence of the crowds that McCain and Palin are drawing with people shouting "Kill him" and "He's a terrorist" and "Off with his head." Watch the tape of the guy screaming, "He's a terrorist!" McCain seems to shudder at that, he rolls his eyes... and I thought for a moment he'd admonish the man. But he didn't. And now he's selling the Ayres non-story full-time. Yes, yes, it's all he has. True enough: he no longer has his honor. But we are on the edge of some real serious craziness here and it would be nice if McCain did the right thing and told his more bloodthirsty supporters to go home and take a cold shower. We are entering a turbulent period in our country. Validating a bogus accusation that your political rival is a terrorist in our current environment is the most irresponsible thing I've seen a campaign do in many a year. They know they are very likely going to lose this election. And McCain certainly knows that the main reason he is losing is because of the dramatic failures of fellow failed Republican George W. Bush. But even knowing that his candidacy was always very likely doomed is not stopping him from releasing this poison into the bloodstream of the body politic, a poison which will be with us for a long time to come. I guess that's what McCain means when he says that Americans should fight for a cause greater than themselves. That cause, evidently, is him. McCain and Palin have decided to stoke this rage, to foment it, to encourage paranoid notions that somehow Obama is a "secret" terrorist or Islamist or foreigner. These are base emotions in both sense of the word. But they are also very very dangerous. This is a moment of maximal physical danger for the young Democratic nominee. And McCain is playing with fire. If he really wants to put country first, he will attack Obama on his policies - not on these inflammatory, personal, creepy grounds. This is getting close to the atmosphere stoked by the Israeli far right before the assassination of Rabin. For God's sake, McCain, stop it. For once in this campaign, put your country first. Sen. John McCain, Gov. Sarah Palin and the leadership of the Republican party have a fundamental moral responsibility to denounce the violent rhetoric that has pervaded recent McCain and Palin political rallies. When rally attendees shout out such attacks as "terrorist" or "kill him" about Sen. Barack Obama, when they are cheered on by crowds incited by McCain-Palin rhetoric -- it is chilling that McCain and Palin do nothing to object. The crisis isn’t the only scary thing going on. Something very ugly is taking shape on the political scene: as McCain’s chances fade, the crowds at his rallies are, by all accounts, increasingly gripped by insane rage. It’s not just a mob phenomenon — it’s visible in the right-wing media, and to some extent in the speeches of McCain and Palin. [snip] What happens when Obama is elected? It will be even worse than it was in the Clinton years. For sure there will be crazy accusations, and I wouldn’t be surprised to see some violence. To my knowledge neither McCain nor Palin has uttered a single syllable of protest as their crowds indulged their fear and loathing of Obama. It's hard to overstate how reckless and lacking in leadership this is -- and how dangerous this is, too. [snip] But neither McCain nor Palin has taken a single step to do anything like that. Surely that's the big story here. Coleman himself has been running one of the nastiest negative advertising campaigns in the country against his Democratic challenger Al Franken. Coleman, who had been polling 9 points ahead of Franken just last month, now finds himself badly trailing Franken, in several recent polls, because of voter backlash to his massive barrage of nasty negative campaign advertising against Franken. Coleman told reporters, at the last minute, that he would not be appearing with McCain at a planned McCain rally scheduled for late Friday afternoon in Minnesota. After more than an 18 point reversal in polls in less than a month and falling 9 points behind Frankin in the most recent Minneapolis Star Tribune poll Coleman said he would change his tactics and his tone, "to connect with people and let them know there's hope. . . people need hope and a more positive campaign is a start "
"At times like this, politics should not add to negativity -- it should lift people up with hope and a confident vision for the future," Coleman said in prepared remarks. "And second, I decided that I was not all that interested in returning to Washington for six years based on the judgment of voters that I was not as bad as the other two guys." Coleman told reports that he decided to not join McCain at his rally so that he could spend the time to work on suspending his own negative ads. The Franken campaign was unimpressed - "Given that this week's polls are clearly showing that Minnesotans are sick of Norm Coleman's [negative] campaign of character assassination, today's stunt rings as a cynical ploy designed to change the subject and avoid scrutiny of his own record," said Andy Barr, Franken's communications director, "It's like an arsonist burning down every house in the village and asking to be named fire chief." "I am enthusiastic and encouraged by the enthusiasm and I think it's really good. . . We have to fight and I will fight, but we will be respectful. I admire Senator Obama and his accomplishments and I want to be respectful. However, McCain's attempt to walk back his campaign's overheated rhetoric seems less than sincere given that moments later at that same rally, McCain renewed his attacks on Obama for his association with the 1960s radical William Ayers and told the crowd, “Mr. Obama’s political career was launched in Mr. Ayers’ living room.” (This immediate turnabout attack of Obama to audience cheers is not being shown by the cable news channels.) Plus, while McCain was making his conciliatory comments, immediately followed by additional attacks on Obama at that Minnesota campaign rally, his campaign released a new video (at left) calling Obama a terrorist. So, really, it looks like McCain put on a little Friday afternoon show to get a "McCain defends Obama" video loop for the Friday night and weekend cable news cycles. McCain's new ad also attempts to blame Democrats for the financial crisis precipitated by Republican sponsored banking deregulation and the Bush Administration's refusal to enforce the few regulations left on the books that Republicans had not yet legislatively eliminated. Republicans were singing a different tune at their national convention in early September 2008, just before their deregulated house of cards began to collapse in free fall onto American taxpayers - video left. The global financial meltdown has caused a dramatic shift in the 2008 presidential race, according to the latest NEWSWEEK poll. With four weeks left in the presidential campaign, Barack Obama now leads John McCain by double digits, 52 percent to 41 percent among registered voters—a marked shift from the last NEWSWEEK poll, conducted one month ago, when the two candidates were tied at 46 percent. Underlying Obama's surge in support: An historic boiling over of dissatisfaction with the status quo. An astounding 86 percent of voters now say they are dissatisfied with the way things are going in the United States, while a mere 10 percent say they are satisfied. That's the highest wrong track/right track ratio ever recorded in the NEWSWEEK poll. All nine justices on the Texas Supreme Court received an “F” on a new scorecard released by Court Watch, a non-profit consumer project that monitors the state’s highest court. What is the Texas Supreme Court? The Supreme Court of Texas is composed of a Chief Justice plus eight Justices and it is the court of last resort for civil matters in the State of Texas. The Supreme Court has statewide appellate jurisdiction in most civil cases, which include contract, personal injury, family and juvenile cases. A different court, the Texas Court of Criminal Appeals, is the court of last resort for criminal matters. The Justices of the Supreme Court are elected to staggered six-year terms in state-wide elections. When a vacancy arises the Governor of Texas may appoint Justices, subject to Senate confirmation, to serve out the remainder of an unexpired term until the next general election. Five of the current Justices, a majority, have been appointed by Governor Rick Perry (R) and all the current Justices, like all the Judges of the Texas Court of Criminal Appeals, are members of the Republican party. All justices are elected to a "court place position" in state-wide general elections. Other than Place 1, which is reserved as the Chief Justice place position, the Supreme Court place numbers have no special significance. Graphical Guide to the Court System of Texas. Graphical Guide to the Court System of Texas. Court Watch reviewed each of the 110 opinions issued by the Court during the 2005-2006 term, 69 of which are classified as consumer cases. Court Watch determined how often each justice sided with consumers. With just a 39% record of voting in favor of consumers, Justice Harriet O’Neill had the Court’s highest consumer score. Meanwhile, Justice Don Willett had the lowest rate with a minuscule 11%. The average pro-consumer score was a paltry 22%. Winslow points out that it is not surprising that the Court would find in favor of insurance, medical, governmental, and other corporate interests over individual consumers. In the 10 years that Court Watch has been monitoring and reporting on the Court’s decisions, the Texas Supreme Court has consistently and overwhelmingly ruled against Texas families. “Year in and year out, the Texas Supreme Court distinguishes itself as an activist, pro-defendant Court,” said Winslow. The Court ruled against consumers a whopping 84% of the time. This is the highest consumer loss rate in Court Watch’s 10-year history. The Court tied its highest defendant win rate at 82%. The Court voted in lockstep. With an average rate of agreement with the majority of 90%, the Court lacks any real dissenting voices. The Court overturned citizen juries in consumer cases a staggering 81% of the time. Every voter in Texas will have the opportunity to replace three of the Republican Texas Supreme Court Justices with three highly qualified Democratic Justices. McCain Calls Americans His "Fellow Prisoners"